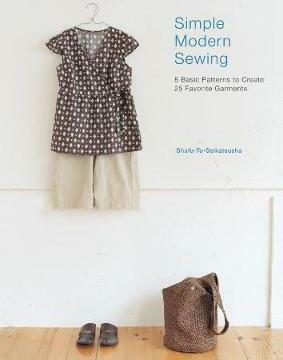 In Simple Modern Sewing, sewists will learn how to make a closetful of comfortable and easy go-to garments without needing a library of separate patterns. All that is required to make these twenty-five unique designs are the eight included basic templates that show readers how to fold and cut the fabric for each piece. The patterns are easy and adaptable with no-fuss sizing. Beginning sewing patterns are often boring or unappealing in favor of being easy to sew. These twenty-five patterns are all quick to make from basic shapes, but are still stylish and modern. Once these basics are mastered, sewists can utilize their creativity to make each piece unique by using different fabrics or by adding embellishments such as a print lining or contrast stitching. Both beginner sewists looking to make their own clothes and advanced sewists who want quick and simple projects will love the easy-to-make and wear garments in Simple Modern Sewing. Shufu-to-Seikatsusha is a leading craft and lifestyle publisher in Japan.